Brook “Trout” Leiphart’s No-help Approach to Highpointing Nets Him 50 State Highpoints! The 50 USA state highpoints took me 31 years to complete. I NEVER used any of 50 state highpoint books for help. I thought that would make it too easy. Half of the fun for me was finding each state highpoint using only my road atlas. In the midwest, I knocked on many a door asking people where it was. This made each experience richer for me by talking to the local people who were all very kind. We enjoyed many a story. I’m so glad I got to meet Guru Jack. We spent hours together. He had just had heart surgery (11-11-99). What’s funny to me is I climbed McKinley in 1977. If I had finished all the 50 highpoints back then I would be #3 on your list. In 1999-2000 I took another year sabbatical and went around the world for 9 months, and hiked in many countries. I have a picture of me with the highpoint flag #89 on top of the highest mountain top in Tasmania, Australia. 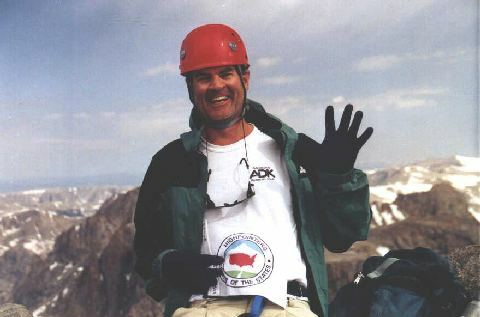 Wyoming was my 50th USA State highpoint. I went with a guide and another gentleman on a five-day round trip hike. I tried it last year solo but was unable to summit. I started with Mt. Washington, New Hampshire (6,288') in the autumn of 1971 when I was in college in New Hampshire. I tried Mt. McKinley (20,320') in Alaska in 1975 when I graduated and had to turn back due to avalanche danger. I did summit in 1977. So, after I had Mt. McKinley (Denali), I knew I could do the rest on vacations over the next many years. I moved from Atlanta, Georgia to New England in 1996 to teach at Nature's Classroom and finished hiking the high peaks (over 4,000') in New Hampshire and New England (65 total peaks), only to find out two more peaks had been added in Maine and one peak in New Hampshire had changed. I did not hike these three until 2001 when I finished hiking the high peaks in New York. Clubs keep records and assign completion numbers. I'm #4814 in the Adirondack's of New York ("ADK 46-R") and #400 for the 'Northeast 111" (now up to 115 peaks). I never registered for the New Hampshire or the New England high peaks. It’s hard to believe so few have done the 50 state highpoints. I sure am glad to be through with my 31-year mission. Now I feel I can get on with my life and hike in other countries, or do some canoe trips, or just travel.